actual O.D. .84" - 2.38"
See PE Squeeze-Off Tool Stops, CTS & IPS or Metric Stops in "Accessories" for specifications. Heavy-duty construction for use on IPS pipe. Double-bar design offers two squeeze points for extra security. Change the stops to use tool on other pipe types. Two-position handle for work location options. Fine thread for smooth squeeze from the operator. Grease fittings at friction points. 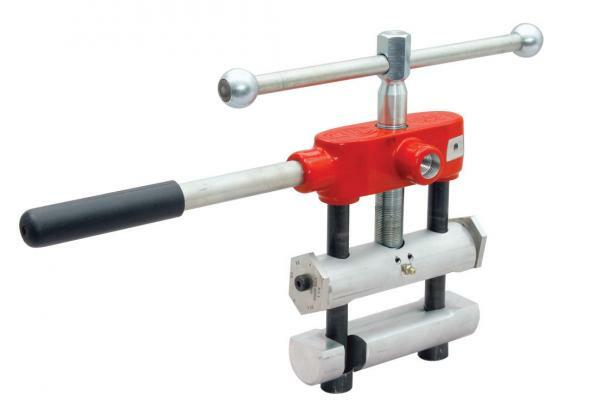 Uses a pair of rotating stops to prevent damage to the pipe. Swing out arm to easily get tool around the pipe. Grounding Accessory and Static Discharge Alarm options.